Lahore: Position holders on visit of European Universities under Chief Minister Muhammad Shahbaz Sharif’s Flagship Programme, have returned homeland. During one month visit, position holders from all over the country visited international universities of Sweden, Germany and United Kingdom. The delegation was consisted of 38 students including 19-Male and 19-Female students. 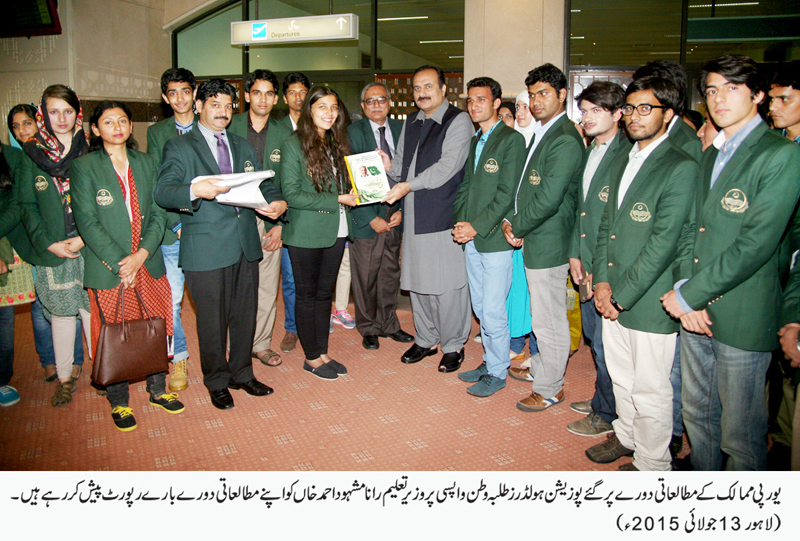 Provincial Minister for Education Rana Mashhood Ahmad Khan welcomed the talented students at Lahore Airport. While addressing the students, the Minister said that the future of Pakistan is linked with provision of quality education. The government is using all out resources for promotion of education, he added. He said that Punjab allocated more education budget than those of all other provinces. He said that government has taken several initiatives for encouragement of shining students including distribution of laptops, cash prizes, tour of European Universities and endowment fund. He said that the government will also provide opportunities to toppers to get education from world renowned universities. He said that education is the most effective weapon to cope with the challenges being faced by the homeland. He said that it is onus on position holders’ shoulders to steer the country out of the problems as they are future of Pakistan. Students from all over the country paid rich tribute to Chief Minister Punjab for provision of opportunity to visit European Universities. They said that they have been honored by Chief Minister. They also appreciated the move to encourage position holders from all provinces saying that it will help build interprovincial harmony and unity which is need of the hour. They reiterated they will leave no stone unturned to earn the good name for the country.